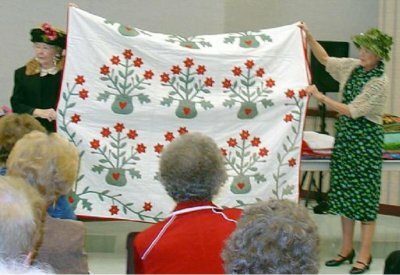 Each of the three NSQG Regions periodically hosts a "Quilt Gathering", bringing a variety of quilt programs to all areas of the state. These programs give us the opportunity to reach out to all quilters, whether they are members or not, and share our love of this enduring art. to demonstrate. She also does all her piecing on a treadle machine. The second speaker of the day was Suzanne Milbourn of Columbus. She talked about her journey in quilting from saying she would never quilt when the shop she was working in started to carry quilting fabric to the award winning quilts she makes today. The last speaker of the morning was Marie Clark of Columbus. Marie shared projects that were started at QuiltNebraska and she actually finished. Lunch was catered by Hy-Vee of Columbus. After lunch our speaker was Sondra Burnett of Columbus. She and her husband have traveled the world. They have been in 54 countries and all 7 continents. She brings fabric home as her souvenirs. She had stories about going to great lengths to find fabric in some unsafe places. She shared how she got the fabric, how she handled it before she quilted it. She showed approximately 30 quilts and we were to guess where the fabric came from. I think a nice day was had by all. 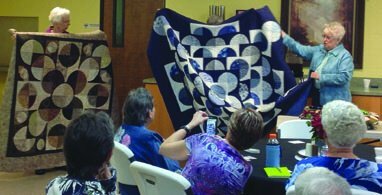 The 2017 District 3 Quilt Gathering was held April 29 in Ogallala, Nebraska at the Petrified Wood Gallery. We had 40 people enjoy the day, attending from as far away as Wilcox. The morning activity was a round-robin session. Three quilt shops took part, including Prairie Pines Quilt Shop from Gering, Sew Blessed Quilt Shop from McCook, and the Quilt Rack from North Platte. The 4th session was led by Susan Hanson, a talented quilter who shared her expertise in creating quilted mosaics. The noon meal was catered by “The Lampstand” coffee shop of Ogallala. We were thrilled to have the 2017 NSQG raffle quilt “Scarlet Sampler” on display for the event. The afternoon session was a wonderful talk and trunk show presented by Peg Spradlin of Cozad, Nebraska. Peg has had quilts and articles published in various quilting magazines and is a regular contributor to Quiltmaker’s 100 Blocks and Quilts from “Quiltmaker’s 100 Blocks.” She had lots of great quilts to share and graciously answered many questions posed to her by the people attending. The day closed with drawings for door prizes and everyone traveled safely back home. 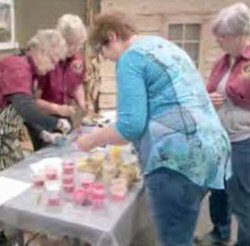 Region I hosted "Quilters Day Out" in Hastings on April 29, 2017. Eighty-four ladies attended the full day of activities, which were three mini-sessions in the morning and the guest speaker, Diane Harris, in the afternoon, “Making Extraordinary Scrap Quilts”. The Region 2 Quilt Gathering was held August 27, 2016 at the Immaculata Monastery in Norfolk. Our day started off with coffee and muffins followed by the morning program “Scraps happen! Now what am I supposed to do with them?” Katie Wilson (Norfolk), Sandi Kosch (Shelby), Elaine Koenig (Norfolk), Deb Austin (Hoskins) and Susan Schoenauer (Norfolk) talked about how they used scraps. Katie described the Mile-A-Minute block she does and had several quilts to show using that method. Sandi explained how she does a 60-degree Scrap Zig Zag Quilt and showed the beautiful one she made. Elaine demonstrated how to make Easy Hexagons. Fabric, needles and thread were provided so all the ladies could make one along with her. Deb explained several ways to cut up leftover 4 patch and 9 patch blocks and turn them into disappearing 4 and 9 patches. She had several samples showing what they would look like. Susan shared ideas on using 5 inch and 2 1⁄2 inch squares. A catered lunch from Hy-Vee followed the morning program. Our afternoon program was Stories of Inspiration by Diane Gubbels from Coleridge NE. Diane showed over 100 of her beautiful quilts/quilt related items and shared the wonderful stories that went withthem. The Calico Quilt Club from Columbus also brought their raffle quilt to display and sell tickets. Several tickets were also sold for the NSQG raffle quilt despite the fact the quilt wasn’t actually there. It was entered in the State Fair. Over 90 ladies attended the Gathering and after listening to their comments afterword, I can happily report an enjoyable day was had by all. The day was held at the Funk Community Center and started with rolls and coffee at 9:30 with the program starting at 10:00. The ladies were welcomed by state president Marty Kleppinger followed by a demonstration by Carolyn Lane of Westerville, NE on packet Potholders. Then Kristi Purintun from Overton introduced us to fabric coloring. The morning's featured speaker was Ruth Johnson from Holdrege with Vintage Aprons. This was followed by a demonstration on making a sewing machine mat by Kathy Beck from Elwood. We finished the morning by talking about items made for charity projects. Carolyn Lane demonstrated an easy way to make pillow cases. Plum Creek Quilters and Prairie Quilt Guild showed items from some of their charity projects. The morning was ended by Barbara Shepardson of Mason City giving tips on strip piecing for quilts. We broke for lunch served by Grinders Food Truck from Holdrege. The afternoon was spent with Diane Volk Harris from Quiltmaker Magazine with her presentation of 100+ Small Quilts. We presented door prizes to 12 ladies and our presenters for a total of 20 quart jars with flowers. The day was attended by 80+ ladies. On Saturday, October 17th, 2015, quilters of southeast Nebraska met at the Homestead National Monument Educational Center in Beatrice to share a fun and educational afternoon. Irene Fisher and Linda Myers greeted 43 quilters as they arrived for the event. Prior to the program, attendees could view an English paper piecing demonstration by Lynn LaBalle, a red and white quilt display by local quilters and photographs of the barn quilts made by previous participants in the barn quilt classes held in Beatrice. As the program began, Sharon Clark, Region 1 Director, welcomed everyone to the quilt gathering. Sharon invited everyone to join the Nebraska State Quilt Guild and informed attendees on some of the activities that are sponsored by the Nebraska State Quilt Guild. The featured speaker of the day was Tresa Jones of Seneca, Kansas. Tresa is the organizer of Baltimore on the Prairie. Baltimore on the Prairie is held every September in Nebraska City at the Leid Center. Tresa’s program for the day was Infinite Amazement: The Red and White Quilt Show of the Century. Tresa talked about her trip to New York City and the Red and White quilt show held at the Park Avenue Armory in March, 2011. The quilts were on loan from the collection of Joanna S. Rose. When Mrs. Rose was asked what she wanted for her 80th birthday, she told her husband two things, something she had never seen before and a gift for New York City. Her family, with the help of the American Folk Art Museum, arranged the display of 651 red and white quilts from Mrs. Rose’s collection. It was the largest exhibition of quilts ever held in the city. A book of the event is available from the American Folk Art Museum. The morning of the quilt gathering, Friends of the Homestead sponsored a barn quilt class. The instructor, Kay McKinzie of Beatrice, displayed several barn quilts to inspire everyone before they started drawing their own quilt block. Kay McKinzie and her team provided class participants with a board, paint and all the supplies they would need to complete their project. Everyone was encouraged to add their barn quilt to the Homestead Barn Quilt Tour. ￼￼￼￼￼￼￼￼￼￼￼￼￼￼￼￼￼￼￼￼￼￼￼￼￼￼￼￼￼￼￼￼￼￼￼￼￼￼￼￼￼￼￼￼￼￼￼￼￼￼￼￼￼￼￼￼￼￼￼￼￼￼￼￼￼￼￼￼￼￼￼￼￼￼￼￼￼￼￼￼￼￼￼￼￼￼￼￼￼￼￼￼￼￼￼￼￼￼￼￼￼￼￼￼￼Thank you to everyone who helped organize the event. Our Speaker was Marilyn Clark of Fremont. She detailed her journey through life with aprons and as a retired home ec teacher. The subject turned to table runners and many patterns and ideas were shared. After a catered salad lunch, bed runners were displayed and shared. The project was a hand-made mug rug to learn wool felt applique. 27 attended the fun day. Thanks to all who helped! We had a very good attendance of 82 ladies from an area from Grand Island on the east side, Valentine on the north end, Smithfield on the south end and Grant on the west. The Sutherland Methodist ladies did an excellent job as hostess and providing an exceptional luncheon. The presenters for the day were Susan Smith, White Glove Coordinator for the State Fair, on behind the scenes activity in the quilt room, how to enter a quilt at the fair and other interesting facts on showing quilts. She was followed by Joyce Snyder on interesting facts about Grace Snyder's life and quilts. She had 2 quilts that Grace had made. One was Joyce's wedding quilt as Joyce's husband was a grandson of Grace's and the second quilt was her hand appliqué of Buffalo Bill and the Wild West. Carolyn Lane provided instructions on making a water bottle cover from quilted material, Nancy Shavlik presented a trunk show of projects that had been completed from State Convention Classes. The afternoon was a presentation by Sharlene Rodewald from Maxwell on Acu Cutter and a trunk show by our featured speaker Patricia Pressler. She told us how each of her award winning quilts had been made and shared many ideas with us. Thank you to the committee of Barbara Shepardson, Bee Bauerle, and Jan Dancer.